This is a map of the long winding channel where the Columbia River forces its way through the Cascade Range of mountains. The rock walls of the Columbia narrowed in the 3 mile, 5 mile, and 10 mile sections of The Grande Dalles, west of Ceililo Falls and The Chutes. These narrow sections of the river, along with the immense force of the water as it met these obstructions, created whirlpools that made The Dalles section of the Columbia the most hazardous to travel. All this part of the Columbia River is under water behind a dam that sits where the Cascades used to be. The Long Narrows of the North West Company was a “five mile stretch of fast water 194 river miles from Fort George,” or Astoria, their then headquarters on the Pacific slopes — according to Lloyd Keith and John C. Jackson, in The Fur Trade Gamble: North West Company on the Pacific Slope, 1800-1820 [WSU Press, 2016]. I am a little uncertain as to what five-mile section of the river they called the Long Narrows, but they could have referred to the Grande Dalles. Certainly the four mile long section of The Dalles was the most ferocious part of the passage through the Cascade Mountains that the NWC and HBC boatmen had to work their way through. Eighteen miles past Fort Nez Perces, the Columbia River turned sharply westward and forced its way through a narrow canyon with perpendicular walls. The rapids that blocked this canyon were followed closely by another set of rapids at the Big Island. With those disruptions behind them, the voyageurs guided their boats down the fast-flowing river until at last they reached the foot of the Cascade Mountains, 100 miles east of Fort Vancouver. This was the most dangerous stretch of the Columbia River. The mountains forced the Columbia through a rocky passage only 150 paces wide, and the river fell 20 feet almost immediately and continued to tumble down rocky rapids, known as The Chutes, as it carved its way to the sea. The voyageurs partially avoided the hazards of The Chutes by beaching their boats and carrying their loads over the narrow trail along the riverbanks. The boats themselves they ran downriver over the three sections of Ceililo Falls and into the rapids of The Dalles, where the river continued its downhill tumble between perpendicular walls of basalt for four rough miles. At the two-mile mark of The Dalles, however, the men and supplies waited on a sheltered beach for the boats, for in the low waters of autumn the remaining rapids were a passable, but exciting, ride. Below the Chutes and The Dalles came the Cascades, a foaming chain of rapids that rushed around a sharp bend in the river and was avoided by the use of a narrow, slippery, four-mile portage along the bank of the Columbia. There were no rattlesnakes here, as there had been on the other portages, for between The Dalles and the Cascades the desert faded away as if a line had been drawn in the sand and the lush green growth of the coast flourished. Much of this information came from the book: The Lifeline of the Oregon Country: the Fraser-Columbia Brigade System, 1811-47, by James R. Gibson. The Dalles mentioned in the quote above had three narrow points in its canyon, and two “dalles” — one the Grande, and the second the Little, or Petite Dalles. In my recent research, I find that some historians called the Grande Dalles “the big eddy.” True enough, as you will see below. I don’t want to confuse you further, but there are three other “Little Dalles” upriver from the Grande Dalles in the Long Narrows. The first Little Dalles occurred in Nespelem Canyon just east of Fort Okanogan; the second upriver from Fort Colvile; and the third in the upper Columbia River close to modern-day Revelstoke, B.C. All were ferocious, and all were named for the the slab-like rock walls that surrounded the roaring river. It was really hard to write my York Factory Express book and make it clear that these are all separate Dalles, but I think I managed to do that. The name Dalles is very correctly said to be a corruption of the French words “d’aller” meaning TO GO but there is another French word of similar spelling meaning flagstone. So we have Father DeSmet’s authentic statement in his book entitled “Oregon Missions” that dalles is “a name given by the Canadian Voyageurs to all contracting running waters, hemmed in by walls of rock.” [T.C. Elliott, “The Dalles-Celilo Portage; its History and Influence,” published in Oregon Historical Quarterly, vol. XVI, Number 2 for June 1915, but also found online]. In the early 1840’s Lieutenant Charles Wilkes, of the United States Exploring Expedition, traveled up the Columbia River to Fort Nez Perces with the incoming brigade [traveling from Fort Vancouver to the interior]. His description of The Dalles is interesting, particularly as he is writing about occurrences that everyone else experienced but did not note. 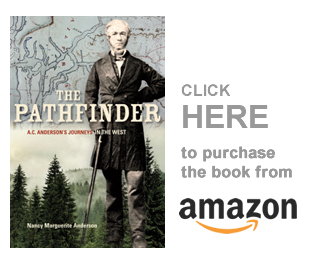 In the evening they camped seven miles west of the Dalles. Already, the roar of its waters was heard distinctly. The Dalles is one of the most remarkable places upon the Columbia. The river is here compressed into a narrow channel, three hundred feet wide, and half a mile long; the walls are perpendicular, flat on the top, and composed of basalt; the river forms an elbow, being situated in an amphitheatre, extending several miles to the northwest, and closed in by a high basaltic wall. From appearances, one is led to conclude that in former times the river made a straight course over the whole..
the paddle song echoed over the stillness of the swiftly gliding stream, and now that necessity forced a “portage” upon them [at The Chutes], the active crew speedily overcame the obstacles, and the boat again floated in safety below. The heat was intense; and though the breakfast hour was gone by, the stench of putrifying salmon [at the Native fisheries] was so overpowering, that I resolved on proceeding a few miles lower down, before taking my morning repast. Accordingly, the men were directed to push off and prepare for the important event of the day, at a spot indicated, while I resolved to saunter downward by land. Little did I then anticipate the sequel. Scarcely had I set out, when the men put forth, and began steering in an oblique direction across the stream, in order to avoid a string of whirlpools that for a short distance impeded the direct navigation; and as the boat shot majestically onwards, I half repented my resolution of walking, envying the swan-like ease with which she appeared to descend, so contrasted with my own fatiguing progress. Suddenly, however, the way of the boat was checked; so abruptly, too, that the rowers were nearly thrown from their seats. Recovering their equilibrium, they bent to their oars with redoubled energy, but the craft yielded nought to their endeavours. The incipient gyrations of a huge whirlpool at the same instant began to be felt, holding the boat within its influence. The vortex was rapidly forming, and the air was filled with a confused murmur, high above which might be heard the hoarse voice of the bowsman, shouting, “Ramez, ramez, ou nous sommes pais!” The danger became momentarily more imminent; there was no longer any doubt of the sad mischance which had befallen them, for yielding to its fatal attracting, the boat glided, at first slowly, into the whirling vortex; its prow rising fearfully as the pitiless waters hurried in round with increasing velocity. Is it surprising that I grew dizzy and faint as I gazed, until at length one wild, long cry warned me that all was over, and suddenly restored my senses to their activity? Alas! to what purpose, save an overpowering sense of grief, was the restoration of my faculties of thought! Utterly incapable of rendering assistance to my drowning companions, I stood a helpless spectator of the scene. The spot where the boat had disappeared, no longer offered any mark whereby to note the sad catastrophe that had even now occurred there, the vortex was filled up, and its very site was no longer distinguishable; for a while it was more like a dream than a real occurrence, so little vestige appeared of the life-struggles which had just taken place. A few moments more, and the paddles, sitting-poles, and various other articles of a buoyant nature, were cast up in all directions around, while here and there, a struggling victim was discernable, hopelessly endeavouring to evade the fate that awaited him. One by one they disappeared, drawn down by the lesser vortices that continually formed, and again as speedily filled up, in the environs of the catastrophe. After a brief interval, nought was to be distinguished but the now mournful rushing of the waters, and I sat down with the consciousness of being left, in the fullest sense, alone. Only one man in the boat survived, and that was a steersman, Baptiste, who managed to hold onto four empty kegs which had been lashed together and was carried downstream through the rest of the rapids. The Natives rescued him some miles below the tragedy. Every one else drowned, and only one or two bodies were found on the beaches below. So, this is The Dalles — The Grande Dalles of the Columbia River. When I write about the various Little Dalles found up and down the Columbia, I will put their links in here. I may also put in the links to the other two barriers that formed a part of this long passage through the Cascades — that is, The Chutes, and the Cascades. Copyright, Nancy Marguerite Anderson, 2016. All rights reserved. Nancy, I sure enjoy your posts. Think John Day’s rescuers (twice) were Umatillas. They are Sahapatin speakers (like Nez Perce) who lived on the lower Umatilla River. The Nez Perces didn’t get much further south than Pataha Creek. We spell Fort Nez Perces with a stress mark above the second “e.” About this time of year John Jackson used to send me (and many others) a little excerpt from some obscure 200-year old post journal describing their New Years’ celebration. Your posts are completely different from John’s but every bit as good. Thanks much, Merry Christmas. Yes, when writing in Word I put the stress mark in Nez Perces but not in WordPress. I don’t know how to do it. James Douglas put all the Natives on that part of the world under Walla Wallas, I think, because they spoke a common language — except he excluded the Cayuse.What he actually said on his arrival at Fort Nez Perces in 1835 was this: “At 2 o’clock arrived at Fort Nez Perces where an immense concourse of Indians are assembled from all quarters, consisting of various tribes, namely, Nez Perces under which general name may be included the Pellouches, Walla Wallas, Yakemas, and the scattered inhabitants of the River who possess a common language and derive their different appellations from their places of residence or some other important cause, rather than from any striking national dissimilarity; and another tribe called Cayauses whose language is entirely distinct from the others.” Of course, he was at Fort Vancouver and never worked among these people. Yes, its fun writing these, but this one took me all day. I was not in a writing mood, I guess. It’s great to see a note from Sam Pambrun, a direct descendant of Pierre C. Pambrun, the Clerk then Chief Trader in charge of Fort Nez Percés, 1831-41 (and the only French Canadian promoted to Chief Trade in the Columbia District. I see that in a later book Lt. Wilkes may have written as though the description of the dalles is from his own observations. From his original report, published in 1856 (available for full and free download on Google Books), it’s clear that Wilkes sent a subordinate, Mr. Drayton, to reconnoiter the Columbia. Drayton hitched a ride with (wait for it) Peter Skene Ogden.